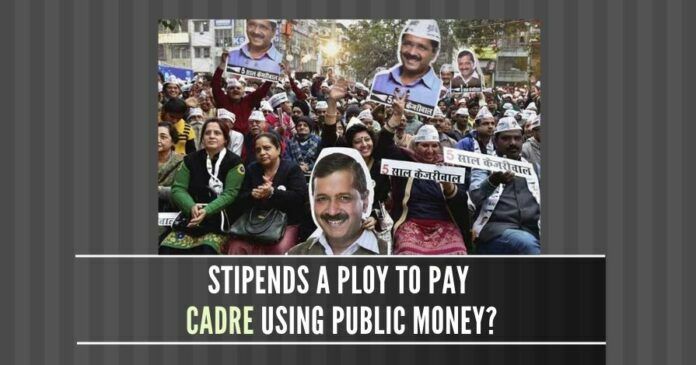 Stipends a new ruse by the AAP to pay the party cadres? The Aam Aadmi Party (AAP) controlled Delhi Assembly is commencing a highly funded two-year research programme for youngsters with monthly fellowships of Rs.1 lakh per month for 50 persons and Associate Fellowships of Rs.60,000 per month for 90 persons. This project is being conducted through the newly opened Delhi Assembly Research Centre (DARC) and the main job of these fellows is to assist the MLAs, Assembly and also Government and allegations have already started by rival parties that this is pumping of public funds to engage the cadres of the ruling party AAP in the election years. This two-year project of engaging of Fellows will cost more than Rs.25 crores to the exchequer. Critics say that AAP is copying the US and European model of engaging their supporters as Research Fellows and using it as a breeding ground for future politicians. The application says that Overseas Indians also can apply for this post. And interestingly 10 posts are reserved for journalists too. The move comes after AAP MLA Somnath Bharti raised the issue in the House one-and-a-half months back about legislators not having any facility to do research and field works pertaining to legislative affairs. Following the concern flagged by Bharti, Speaker Ram Niwas Goel had ordered the General Purpose Committee (GPC) of the House to submit its report on the issue. “A consolidated sum of Rs 1,00,000 per month to fellows and Rs 60,000 per month to interns will be provided in the form of a stipend. Delhi Technological University (DTU) will be managing the entire application process,” the statement said. The interviews will be held between March 13 and March 17. It is said that fellows will be assigned to work with the legislators and Delhi Assembly Secretariat and in close coordination with the departments of the Delhi government. Many officers in the Delhi Assembly said that this project is nothing but to engage the AAP workers and feed them from public money. They point out that giving monthly Rs.1 lakh for Fellows and Rs.60000 for Associate Fellows is quite exorbitant. For assisting MLAs there is a mechanism and many staffers in Assembly and this move is to politicise the system. They also allege that this was a clever ploy to infiltrate the party cadres into the legislature. This is a nice initiative. It should be thoroughly praised. BJP leaders rarely think about these things. The common party workers tend to get treated badly as a result. Common folks have in some cases spent years of their time tending to a constituency only to find out that the candidature is handed out to someone who brings money to the table.